UPDATE: our 2019 General Sale is now CLOSED (but resold tickets can be purchased via TicketPony or our STEP system). See below for details on those, and all else related to tickets. How to access the event – ticket verification at the gate. Buying, selling and transferring tickets. No excuses accepted at the gate. Need help with something not on this list? Log into your Burner Bio here (or create one here) and then click the ‘Buy Tickets’ button to be taken to the ticket checkout on Quicket, our ticketing agent. How many tickets will be sold for AfrikaBurn 2019? A maximum of 13 000. Our event tickets are not refundable (and info on this is always shown on ticket small print, and also on event disclaimers). However, you are able to resell your ticket/s, as we offer three methods of safely and securely reselling your ticket, via our ticketing agent’s platforms, so that you can recoup the cost of your ticket. The Secure Ticket Exchange Programme. Available from 7th August 2018 until Friday 3rd May 2019 @ 17h00 unless the event sells out. From 6th May 2019 Mayday Tickets for the 2020 event will go on sale and remain open until the Friday of the event in 2020. Mayday Tickets for 2019 are limited to 2 per person and are on sale throughout the year. They are designed to accommodate folk who are able to afford a higher priced ticket, and want to secure a ticket early on. Mayday Tickets do not only further enable the AfrikaBurn event but also ensure a substantial contribution to the developmental work of the movement – the stuff we do that has a measurable impact in the default world. Mayday Tickets do not give you any more status than any other ticket type at the event. The second ticket holder will also require a Burner Bio. If they don’t have one, tell them to create one. Designed to make our event accessible to those not able to afford the full ticket price but can afford a reduced-price ticket, subsidised by AfrikaBurn. Applicant categories include students, single parents and others who wouldn’t be able to participate without a little assistance. If you feel you match that description, you can motivate for a subsidised ticket. PLEASE NOTE – these tickets can’t be transferred or sold, as they’re awarded on the basis of a motivation from a specific person. These tickets can be refunded right up until the event by contacting Quicket and requesting a refund provided the ticket hasn’t been checked in. Applications Open: Mon 10 Sept 2018 @ 12h00. Applications Close: Mon 25 Feb 2019 @ 17h00 / or once the application limit has been reached, which ever comes first. You’ll be informed of the status of your application by the following dates, depending on when you submitted your application. If your application is successful, you’ll receive a link to purchase your ticket which you can do at any time before (and even during) the event. These are offered in acknowledgement of the disparity within South Africa and recognition that many economically marginalised individuals don’t have the means to partake in AfrikaBurn. If this rings true for someone in your crew, or someone you know, an Anathi could be their inroad to participation. Coupled with an opportunity to apply for an Access Grant (welfare and/or transport), Anathi Tickets are means-tested and require submission of a bank statement, pay slip or affidavit for each person applying. Because they are awarded to individuals on a case by case basis, Anathi Tickets cannot be transferred, or sold. PLEASE NOTE: These tickets are only available to South Africans or people living in South Africa and nationals of other African countries. Ticket Distribution & Purchasing: Mon 25 Feb 2019 – Fri 8 Mar 2019 @ 17h00. Anathi Ticket applications for our 2019 event are now closed. *these tickets have been renamed ‘Anathi’, which means ‘they are with us’ in isiXhosa. Sales End: Available right up until after the event, and also available to purchase at the gate. Minor Tickets work the same way as General Sales Tickets and will close on Friday 26th April 2019 or when the event sells out, which ever comes first. NB: Minor Tickets are not available at the gate. Kids Tickets are available to kids 14 years and younger. When purchasing a Kids Ticket you will need to state that you are the parent/guardian of the child who will be entering the event with that ticket. Minor Tickets are full-priced tickets available to young adults between 15 and 17. They can only be bought by parents/ legal guardians or elected guardians over 28 years old, who are only allowed to accompany a maximum of 4 minors & kids to the event. This is to ensure that there’s enough adult supervision of kids and minors onsite at the event. To buy either a kids or minor ticket to AfrikaBurn, you’re required to fill out the Agreement of Guardianship form and/or the Parent/Legal Guardian Indemnity form and upload it to the ticket page when purchasing the kids/minor ticket. PLEASE NOTE: All tickets scanned in at the gate will alert the Ticketing Crew that the person being scanned in is a Child or a Minor. The guardian of that child/minor will need to identify themselves to the Ticketing Crew so that they can verify that the Guardian is 28 years and older. Minors travelling with a Guardian younger than 28 years old will not be allowed access to the event. Direct Distribution Tickets will be allocated retrospectively rather than ahead of the General Sales. Only members of Collectives with registered creative projects can request full-price DDT’s if the 2019 event has sold out, and not everyone in your Collective managed to get a ticket. This means is that project leads on Collectives will no longer automatically get an allocation of direct distribution tickets to distribute to their crew. We have seen a decline in Direct Distribution Ticket sales over the past 3 years, and directing Burners directly to the General Sale to secure their ticket, will cut out a chunk on admin for everyone concerned. We cannot say how long the General Sales will take to sell out, so you’re encouraged to purchase your AfrikaBurn ticket sooner rather than later. Sales end: Vehicle Passes will be available online until the end of the event. Vehicle Passes are also available to purchase at the gate. Designed to reduce the number of cars on our event site and on the R355 (road) to AfrikaBurn. One Vehicle Pass is required per vehicle entering the event. Caravans, trailers and Mutant Vehicles do not require a VP. PLEASE NOTE: If you have registered a Creative Project, you will be able to request a limited number of free Vehicles Passes. Once purchased Vehicle Passes are non-refundable, and do not need to match your name and ID number. If you’re part of a Collective with a registered project, you can request a number of Work Access Passes (WAPs), which will allow you & your crew access to the event before Monday 29th April 2019. Without WAPs, you will be denied entry into the event site and will need to camp outside until the AfrikaBurn gate officially opens. NOTE: Work Access Passes will be distributed between Mon 4 Feb 2019 and Thurs 18 April 2019. 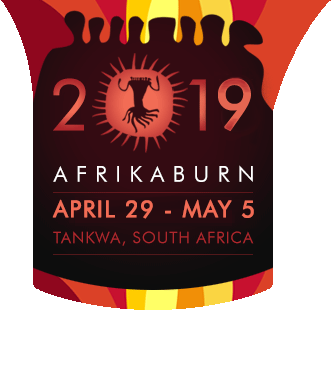 A valid barcoded AfrikaBurn 2019 ticket from Quicket. Your ticket needs to be in your name as displayed on your ID/Passport – Drivers Licences or a certified copy of your ID/Passport are accepted. Your face needs to match the picture in the ID/Passport you present at the gate. NB: If you are arriving before gates officially open, you need to present a Work Access Pass too. From the moment you buy your ticket ’til you arrive at our event gate, a number of different scenarios relating to your ticket could take place. Check out the table below, which will ensure that you A) Arrive at the event gate with all your ticket admin in order, and B) Don’t get taken for a ride should you wish to buy or sell your event ticket privately. If you find that the details on your ticket do not match the details on the ticket holders ID/Passport, or your circumstances have changed e.g. your partner is no longer coming to the Burn, but your daughter is – then you do have the option of editing the details on this ticket. Please note: You have ONE CHANCE to edit the details on this ticket so make sure you insert the correct details, as you can’t go back and change it again. Please ensure that the person whose details are on the ticket has registered a Burner Bio. Click “My Tickets” on the left hand side of the page. Once you transfer your ticket to the new owner, the barcode will be cancelled and a new barcode will be issued to the new recipient. Please ensure that you enter the correct email address in (both times) as the transfer cannot be reversed. If you are purchasing a ticket from a friend, please get them to transfer the ticket to you, as above. STEP enables tickets to be resold in a secure system operated by our ticketing agent, Quicket. If you don’t know anyone to sell your ticket to, or you’d like to buy a ticket to AfrikaBurn but don’t know anyone selling a ticket, then STEP is the best and safest option. Buyers & sellers are placed in a queue, and matched when they reach the front of their queues. The buyer has 24 hours to purchase the ticket once they receive the notification from Quicket that a ticket is available to them. Failure to purchase the ticket will result in it being offered to the next person in the queue and the buyer who failed to purchase gets removed from the queue. Refunds: If the seller places more than one ticket into STEP, they will only be refunded when the last ticket has been sold i.e. the seller will not be refunded as tickets are sold. All refunds are processed once a week on Friday. Mayday ticket holders are not able to sell their ticket on STEP and are encouraged to use TicketPony instead (see below for info on TicketPony). If you have had a ticket transferred into your account, you’re unable to put your ticket onto STEP as you’re not the original buyer of the ticket. We urge you to use TicketPony to sell your ticket on. If you are in the queue waiting for a ticket to become available to buy, but in the meantime you have managed to find a ticket privately, please log into Quicket and go to the inbound queue and remove yourself to give others behind you in the queue a better chance of securing themselves a ticket. STEP closes on Wed 24 April 2019 @ 12h00, after which point no one will be able to enter the queue. By Fri 26 April 2019 @ 17h00 all unsold tickets will be returned to their owners (and will appear in your Quicket basket again). This will give the owner enough time to try and sell their ticket privately. We urge you to use TicketPony for the secure exchange of tickets/payment if you do manage to find a buyer. If you are buying or selling a ticket to someone you don’t know very well, and are concerned about the secure exchange of that ticket and the money, then we urge you to use TicketPony for the secure exchange of payment and ticket. It’s kak, but it’s a fact: desperate sellers and buyers have either been sold fake tickets or never received payment. So even if you think you sort of know the person buying or selling a ticket, rather use TicketPony to eliminate the risk of being taken for a ride. You’ll be able to load your ticket onto TicketPony by clicking the “Sell your ticket” option at the top left hand corner. Once the buyer accepts the purchase they pay TicketPony for the ticket. The money is then transferred into your account the following business day, and the ticket removed from your Quicket account and transferred to the buyer, who can log into Quicket and download the ticket from there. The original barcode will be cancelled and that ticket will no longer be valid. The transferred ticket will be issued with a new bar code which will allow the new owner of the ticket access into the event. A 5% fee will be charged to the seller and 7.5% will be charged to the buyer (which includes payment processing fees). This is a small price to pay to ensure the secure exchange of funds and the legitimacy of your ticket. Non-South African users of TicketPony, please note: you will need to communicate with TicketPony to facilitate a transaction to your PayPal account. AfrikaBurn together with Quicket have made it almost impossible to arrive at the gate with a fake AfrikaBurn ticket. Don’t get caught out or taken for a ride: rather use the secure ticket exchange facilities (STEP, Ticket Transfer, TicketPony) as detailed above. Finally – before you hit the road, make sure that you actually have your ticket printed, or downloaded on a phone/ tablet (which has battery life). Please also ensure that your correct details are on the ticket. If not, our Ticketing crew cannot verify that the ticket is indeed yours, and you will not gain access to the event. Practice Radical Self Reliance – don’t rely on the patchy-at-best internet connections dotted sparsely around the Tankwa Karoo to get your ticket admin in order. Make sure everyone travelling with you has all ticket related admin sorted before you leave too – it will eventually become your problem if they don’t. Trust us, we’ve been watching this movie for years! Thank you, whoever you are and wherever you may be, for making AfrikaBurn happen! 1) The entire event is created by a spirit of participation and volunteerism. If you’d like to pitch in, please consider volunteering by checking out our Participation page, which has loads of links and info on how you can contribute. 2) AfrikaBurn is not like any other event – so you REALLY want to be as prepared as possible. Please browse the links on the Preparation page – and be sure to read the Survival Guide, and share it with your campmates or crew. It will go a long way to making sure your experience is comfortable, safe – and that you understand how the event works. For Quicket-related problems mail [email protected] or call 021 424 9308 (during office hours).